Updated 2/3/19 Please link to, use to educate, and share. Short History of Prices, Inflation since the Founding of the U.S.
1791 First Bank of the United States was funded by taxes and supported by Northern merchants, but not Secretary of State Thomas Jefferson and Representative James Madison both of whom believed the South would not benefit. 1816 Second Bank of the United States, charted due to difficulty financing the War of 1812 and inflation, President Andrew Jackson opposed its financier president Nicholas Biddle, 20 year charter ran out. 1819 Panic the first major financial crisis occurred when the Embargo Act and War of 1812 caused foreclosures, bank failures, unemployment, and a slump in agriculture and manufacturing. 1825 Panic was not in the US. but is important to the current banking systems. See The Most Fantastic Financial Swindle-of-All-Time from the St. Louis Federal Reserve Bank. 1837 Panic the first financial crisis caused by speculative fever started in NY City when banks began would only accept specie (gold and silver coinage) because they questioned the value of state currencies. 1873 Panic resulted when the Coinage Act of 1873 took silver out of the coin money supply. Western mining interests and debtors like farmers were hurt, bank creditors helped. Panic of 1893 Our First Great Recession was caused by railroad overbuilding, shaky railroad financing causing bank failures and a run on the gold supply, and a policy of using both gold and silver metals as a peg for the U.S. Dollar value. 1907 Bankers' Panic occurred when the New York Stock Exchange fell close to 50%, J. P. Morgan stopped runs on banks and trust companies, and the Federal Reserve Act of 1913 was passed. which the FED solved with high interest rates. 1929 The Great Depression was a severe worldwide economic depression that began sudden and total collapse of US stock market prices on October 29. Economist still can't agree on a cause. 1981-82 Recession was severe and occurred when the Federal Reserve to began lowering inflation by drastically decreasing the money supply just as bank deregulation allowed them to expand into risky ventures. 1980's and 1990's S&L Crisis saw 747 failures at a cost of $160 billion($125 billion was a government bailout) It was caused by real estate losses from the Tax Reform Act of 1986 and S&L deregulation problems. 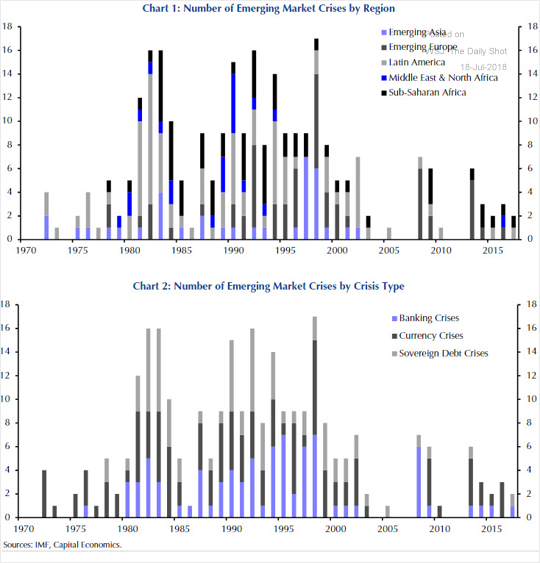 The Great Recession of 2007-2009 began in the US and spread to much of the industrial world.. 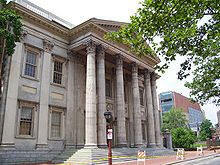 The First Bank of the United States was chartered for 20 years by the United States Congress in 1791. Officially proposed by Alexander Hamilton, Secretary of the Treasury, to the first session of the First Congress in 1790, the concept for the Bank had both its support and origin in and among Northern merchants and more than a few New England state governments. "The tendency of a national bank is to increase public and private credit. The former gives power to the state for the protection of its rights and interests, and the latter facilitates and extends the operations of commerce amongst individuals." The Second Bank of the United States was chartered in 1816 resulted because of the U.S. had experienced severe inflation and had difficult financing the War of 1812. . Subsequently, the credit and borrowing status of the United States were at their lowest levels since its founding. The Bank of the U.S. was in no sense a national bank but rather a privately held banking corporation. The bank's relationship with the federal government that gave it access to substantial profits. Its role as the depository of the federal government's revenues made it a political target of banks chartered by the individual states. partisan politics highlighted the debate over the renewal of the charter. "The classic statement by Arthur Schlesinger was that the partisan politics during the Jacksonian period was grounded in class conflict. Viewed through the lens of party elite discourse, Schlesinger saw inter-party conflict as a clash between wealthy Whigs and working class Democrats "(Grynaviski) President Andrew Jackson strongly opposed the renewal of its charter, and built his platform for the election of 1832 around doing away with the Second Bank of the United States. Jackson's political target was y the very wealthy Nicholas Biddle, financier, politician, and president of the Bank of the United States. Apart from a general hostility to banking and the belief that specie (gold and/or silver) was the only true money, Jackson's reasons for opposing the renewal of the charter revolved around his belief that bestowing power and responsibility upon a single bank was the cause of inflation and other perceived evils. The Second Bank of the United States thrived from the tax revenue that the federal government regularly deposited. Jackson struck at this vital source of funds in 1833 by instructing his Secretary of the Treasury to deposit federal tax revenues in state banks, soon nicknamed "pet banks" because of their loyalty to Jackson's party. The Second Bank of the United States was left with little money and, in 1836, its charter expired and it turned into an ordinary bank. Five years later, the former Second Bank of the United States went bankrupt. 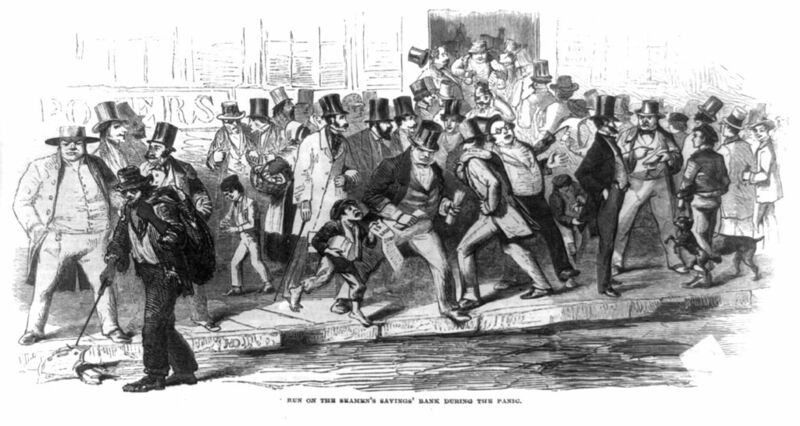 Panic of 1837 was a financial crisis caused speculative fever. The bubble burst in 1837 NY City when every bank began to accept payment only in specie (gold and silver coinage). Economic policy of both the previous administration of Andrew Jackson and recently elected current administration of Martin Van Buren, were blamed as well as bank excesses. Within two months the losses from bank failures in New York alone aggregated nearly $100 million. "Out of 850 banks in the United States, 343 closed entirely, 62 failed partially, and the system of State banks received a shock from which it never fully recovered." The publishing industry was particularly hurt by the ensuing depression. According to most accounts, the economy did not recover until 1843. Most economists also agree that there was a brief recovery from 1838 to 1839, which then ended as the Bank of England and Dutch creditors raised interest rates. However, economic historian Peter Temin has argued that, when corrected for deflation, the economy actually grew after 1838. Panic of 1857 was brought on mostly by the people's over-consumption of goods from Europe to such an extent that the Union's Specie was drained off, overbuilding by competing railroads, and rampant land speculation in the west.. The recession ended a period of prosperity and speculation that had followed the Mexican-American War (1846-1848) and the discovery of gold in California. 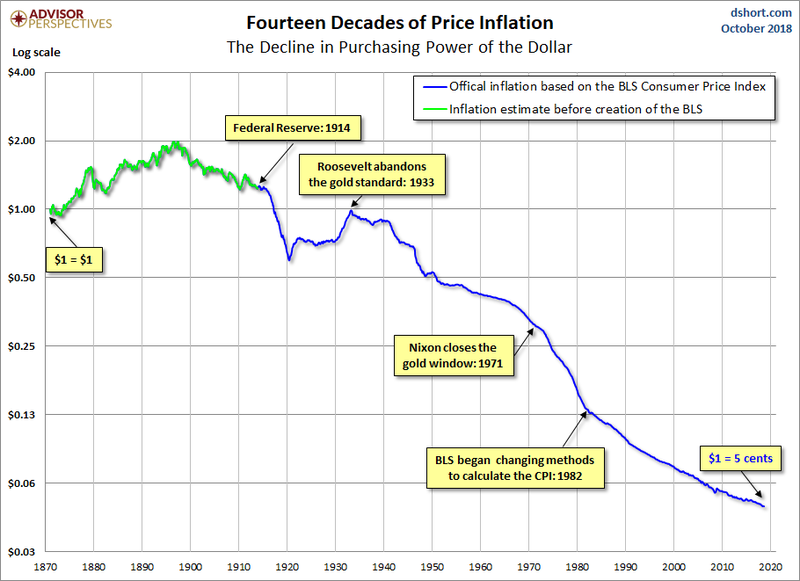 Gold poured into the economy causing inflated. After a large increase in state banks in the early 1850's, by July 1856, state banks began to lend far more money than they could back up in specie even as deposits began to fall. The panic began with a loss of confidence in an Ohio bank, spread as railroads failed, and fears that the US Federal Government would be unable to pay obligations in specie. More than 5,000 American businesses failed, the stock market declined by 66% compared with inflation, and unemployment resulted in urban protests. An October bank holiday was declared in England and New York to avert runs on those institutions. The Tariff Act of 1857 reduced the average tariff rate to about 20%. Written by Southerners and supported by most economic interests nationwide, except for sheep farmers and some Pennsylvania iron companies, it had the effect of removing the tariff issue as a major source of North-South contention. The South was much less hard-hit than other regions, because of the stability of the cotton market. No recovery was evident in the northern parts of the United States for a year and a half, and the full impact did not dissipate until the American Civil War. See Panic of 1857 Panic/Depression of 1873-1879 began when the he post civil war rail road boom ended and the passage of the Coinage Act of 1873, which took the United off a bimetallic (gold and silver) money standard. The immediate effect was to depress silver prices which hurt Western mining interests, who labeled the Act "The Crime of '73." It also reduced the domestic money supply raising interest rates and hurting farmers and other large debtors. The resulting outcry created the fear of an unstable money supply and investor shunned bonds and other long-term obligations. This lack of confidence in bonds slowed the railroad boom and exacerbated the economic situation. For example, Jay Cooke & Company, a major component of the United States banking establishment, cancelled plans for a second transcontinental railroad as two major funding sources disappeared. In 1873 he was unable to market several million dollars in Northern Pacific Railway bonds and lost out on a $300 million government loan as reports circulated that his firm's credit was worthless. The firm declared bankruptcy in September of 1873. Panic of 1893 was a serious economic depression in the United States because of railroad overbuilding and shaky railroad financing which set off a series of bank failures. Compounding market overbuilding and a railroad bubble was a run on the gold supply and a policy of using both gold and silver metals as a peg for the US Dollar value. delivered by William Jennings Bryan at the Democratic National Convention in Chicago. advocated bimetallism. Following the Coinage Act (1873) the U.S. was on a de facto Gold Standard. In 1896, the Democratic Party wanted to standardize the value of the dollar to silver and opposed a monometallic gold standard. The inflation that would result from the silver standard would make it easier for farmers and other debtors to pay off their debts by increasing their revenue dollars. 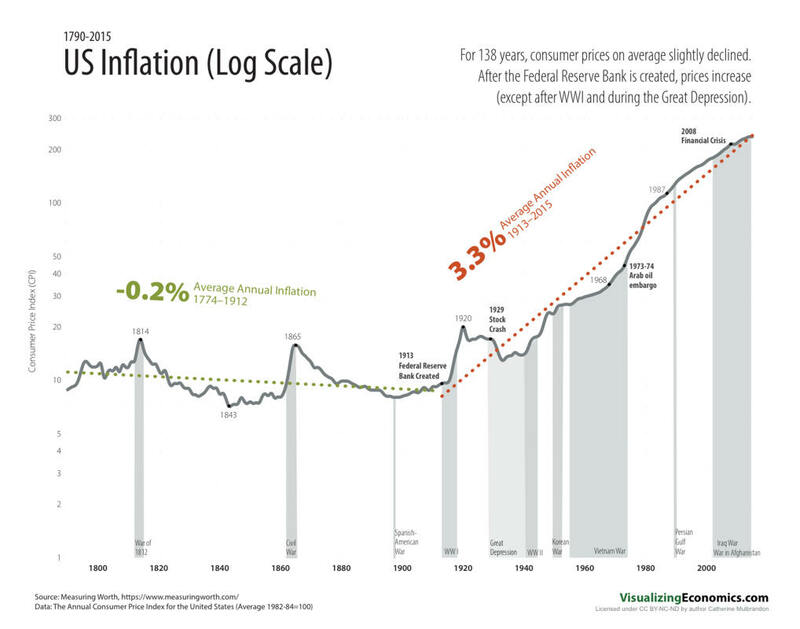 It would also reverse the deflation which the U.S. experienced from 1873 to 1896. Backers of a monometallic gold standard felt that protection against inflation was of paramount importance, and they believed that a monometallic gold standard was the best way to achieve this end. Inflation is disadvantageous for creditors, and degrades the value of savings. Saving represents deferred spending and a source of capital for lending. William Jennings Bryan secured the Democratic Party nomination at the convention, but was beaten in the presidential election by William McKinley. This situation was repeated in the year 1900 and the United States adopted the monometallic gold standard de jure in that year. By the first decade of the twentieth century, only Kong remained on the silver standard. Panic of 1907, known as the 1907 Bankers' Panic, was a financial crisis that occurred when the New York Stock Exchange fell close to 50% from its peak the previous year. There were runs on banks and trust companies. Many state and local banks and businesses entered into bankruptcy. New York City bank liquidity problems, loss of confidence among depositor, exacerbated by unregulated side bets at bucket shops caused the panic. The crisis was Triggered by the failed attempt in October 1907 to corner the market on stock of the United Copper Company, lending banks suffered runs that later spread to affiliated banks and trusts, leading a week later to the downfall of the Knickerbockers Trust Company�New York City's third-largest trust. The collapse of the Knickerbockers spread fear throughout the city's trusts as regional banks withdrew reserves from New York City banks. Panic extended across the nation as vast numbers of people withdrew deposits from their regional banks. Industrial production dropped further than after any bank run before then, while 1907 saw the second-highest volume of bankruptcies to that date. Production fell by 11%, imports by 26%, while unemployment rose to 8% from under 3%. Immigration dropped to 750,000 people in 1909, from 1.2 million two years earlier. The panic may have deepened if not for the intervention of financier J. P. Morgan, who pledged large sums of his own money, and convinced other New York bankers to do the same, to shore up the banking system. At the time, the United States did not have a central bank to inject liquidity back into the market. By November the financial contagion had largely ended, yet a further crisis emerged when a large brokerage firm borrowed heavily using the stock of Tennessee Coal, Iron and Railroad Company (TC&I) as collateral. Collapse of TC&I's stock price was averted by an emergency takeover by Morgan's U.S. Steel Corporation�a move approved by anti-monopolist president Theodore Roosevelt. A commission investigation lead to the Federal Reserve System. Consider by some as a mistakes in Federal Reserve policy as a key factor in the crisis. In response to post�World War I inflation the Federal Reserve Bank of New York began raising interest rates sharply. In December 1919 the rate was raised from 4.75% to 5%. 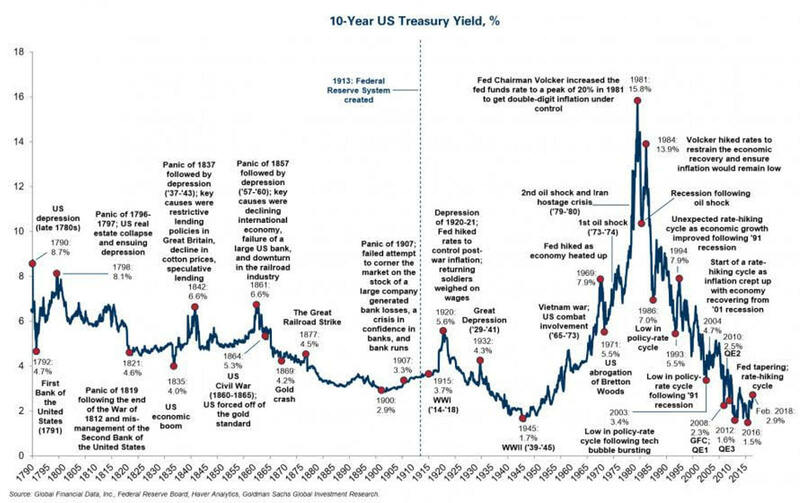 A month later it was raised to 6%, and in June 1920 it was raised to 7% (the highest interest rates of any period except the 1970s and early 1980s). 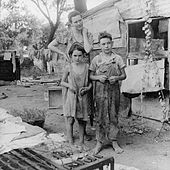 1929 Second Great Depression was a severe worldwide economic depression that began sudden and total collapse of US stock market prices on October 29. 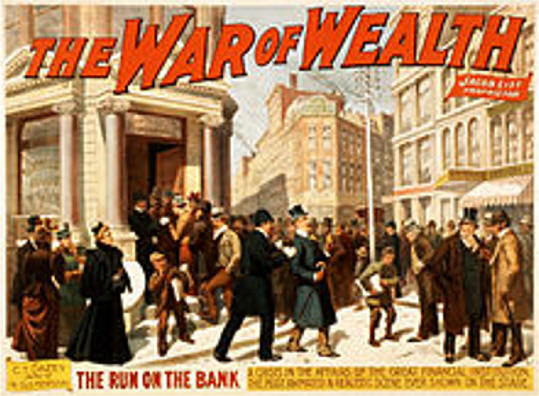 As for causes, historians emphasize structural factors like massive bank failures and the stock market crash, while economists point to monetary factors such as actions by the US Federal Reserve that contracted the money supply, and Britain's decision to return to the Gold Standard at pre-World War I parities (US$4.86:�1). Demand-driven causes include Keynesian economics, the breakdown of international trade, and Institutional Economists who point to under consumption, an over-investment economic bubble, malfeasance by bankers and industrialists, and incompetence by government officials. Monetarists believe what started as an ordinary recession was made worse by significant policy mistakes by monetary authorities (especially the Federal Reserve which shrink the money supply which greatly exacerbated the economic situation). 1981-82 recession was severe and occurred when the Federal Reserve to began lowering inflation by drastically lowered the money supply. In the wake of the 1973 oil crisis and the 1979 energy crisis, stagflation began to afflict the economy of the United States. Banks had a tough time as a recent wave of deregulation had phased out a number of restrictions on banks' financial practices, broadened their lending powers, and raised the deposit insurance limit from $40,000 to $100,000 (raising the problem of moral hazard). Banks rushed into real estate lending, speculative lending, and other ventures just as the economy soured. In 1982 Congress further deregulated banks as well as savings and loans letting banks offer money market accounts in an attempt to encourage deposit in-flows, removed additional statutory restrictions in real estate lending, and relaxed loans-to-one-borrower limits. This encouraged a rapid expansion in real estate lending at a time when the real estate market was collapsing, increased the unhealthy competition between banks and savings and loans, and encouraged overbuilding of branch banks. In 1984, Continental Illinois National Bank, the nation's seventh-largest bank failed and, federal regulators were willing to let the bank fail in order to reduce moral hazard and encourage safer practices but Congress and the press felt Continental Illinois was "too big to fail." and a $4.5 billion rescue package resulted. 1980s and 1990s S&L crisis was the failure of 747 S&Ls aka thrifts that cost about $160 billion, of which about $125 billion was paid for by a US government bailout. Causes included the Tax Reform Act of 1986 which removed many real estate tax shelters thus decreasing real estate values tied to said shelters, the deregulation of S&Ls which gave them many of the capabilities of banks, without the same regulations as banks, the "moral hazard" of insuring already troubled institutions who in order to improve liquidity, made unsound real estate loans on riskier assets, particularly land and a "asset-liability mismatch" at S & L's, who having made long-term loans at a fixed rate, found themselves borrowing at an ever increasing rate and needing riskier loans to cover these higher rates. Deutsche Bank Said to Securitize Corporate Loans to Offload Risk (Bloomberg) Deutsche Bank AG, under pressure to bolster its balance sheet before resolving a U.S. mortgage probe, is working to securitize billions of dollars of corporate loans to offload risk, according to a person with knowledge of the matter. The bank is structuring the transaction as a synthetic collateralized loan obligation, which means the firm would keep servicing loans while transferring risk to investors, said the person, who asked for anonymity because the deal is pending. Germany�s biggest bank has been doing similar deals for years to manage risks from corporate lending, the person said. 1) Insurable interest required for financial activities like selling short. 3) All activities involved with financial markets be taxes as short or long term investments. Average ratio to GDP of unsecured and mortgage bank credit refinancing?